After picking up a hire car on arrival in the Faroe Islands, I looked at the directions to the scenic villages of Bøur and Gásadal. “Turn left when leaving the airport,” they started – and finished. The Faroes is made up of 18 individual islands, but there aren’t many roads to get lost on. The Faroes sit in the middle of the Atlantic Ocean, more or less due north of Scotland, roughly halfway between Iceland and Norway. Bare green mountains rise out of the water – the wind sweeping the islands does not make life easy for trees. Sheep stroll nonchalantly along cliff edges, then, as if velcroed-on, straight down them. Fjords look deceptively calm, but open on to the wildest of seas. 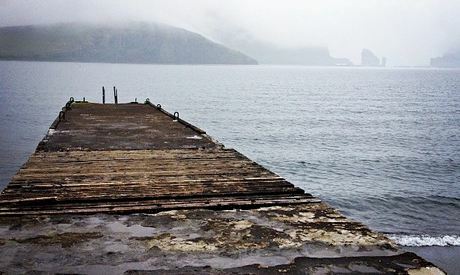 The Faroese economy is still largely based around the twin poles of sheep and boats – with wool its currency. A Faroese proverb even states “Ull er Føroya gull”: wool is the gold of the Faroe Islands. Faroese sheep have been selectively bred over centuries to be particularly hardy. Their wool from is therefore exceptionally warm and water-resistant, making them ideal for underwear, socks and jumpers for those seafaring folk. The advent of the 21st century has not altered much – there are no large scale sheep farms or mass industrial production. Sheep roam in small flocks and are largely still sheared by hand in the traditional way. The fleeces are then graded according to colour then spun, and sometimes dyed. Thanks to Sarah Lund, The Killing, and that wardrobe choice, the traditional patterns of the Faroese fisherman’s jumper have had their moment in the fashion spotlight. Though it’s not the first time the export trade has peaked – in the 1900s, the warm, insulating patterns were so popular that an agreement was struck that all Danish army soldiers could have one as part of their uniform. So it would be wrong to say that Faroese craft is having a renaissance – it’s just that the world has started taking notice. A large part of this is down to two women, Gudrun Ludvig and Gudrun Rógvadóttir. Both were living in Denmark when they met – many Faroese people spend time living or studying there, and the islands are an autonomous dependency of the kingdom of Denmark. 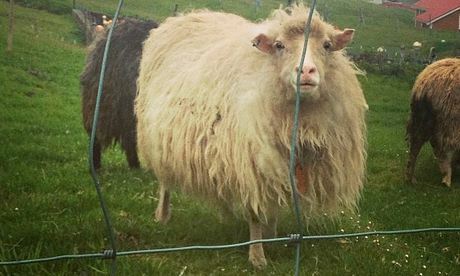 While knitting skills were alive and well, it was a darker time for the wool trade – Rógvadóttir was horrified to discover that sheep’s wool was being burned as a waste product after the animals were sent to slaughter. She asked Ludvig to design some new garments using the wool, and a partnership was born. For women in the Faroes, learning to knit on their mother or grandmother’s knee has always been the norm – but for years, buyers were thin on the ground. The recent increase in demand, fuelled in no small part by that jumper, has meant that knitting needles are once again flashing productively. Indeed knitting is now used to supplement household incomes, with women around the island employed by Gudrun and Gudrun and other knitwear companies to make pieces in their own homes. While the design may be traditional, Gudrun and Gudrun’s success has been in using those patterns but with a whole range of different styles and cuts. Their shop in the capital, Torshavn, is busy, predominantly with women browsing the new collection and admiring the adorable kid’s jumpers: almost everyone under the age of about six I see on my trip is wearing one. 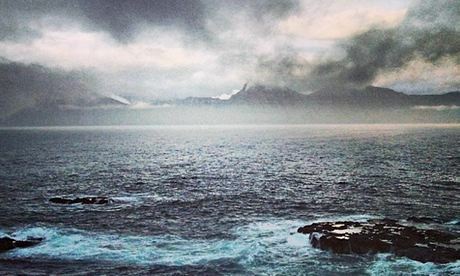 While wool is king, the Faroes are the kind of place where absolutely everyone you talk to turns out to be an artist or designer. I met ceramist Gurðið Poulsen whose workshop home – also in the capital – doubles as a shop where she sells mugs, crockery and less functional larger scale pieces. The colours and forms are muted yet wild, like those of the island itself. Her house is a glorious mix of ceramic-dust and slips in buckets (downstairs) and wood panelling, bright prints and sunshine through wooden window frames (upstairs). She has created works on a grander scale, too, including a square outside the new town gymnastic hall. In a town with population of 20,000 almost everyone knows everyone, so with no need for a map or addresses, Poulsen can direct me around the corner to the house of Mikkalina Nordberg, a glass artist. Mikkalina’s work is charming: bright, vivid glass pieces both functional (little pots for salt and pepper) and purely decorative (light catchers that, in a place where from May to July it never really gets dark, have a lot of light to catch). She is also something of a pioneer, having developed a special method for cold glass work which has led to queries and interest from artists around the world. Out of the capital, in the village of Gjógv, at a grass-roofed guesthouse (grass roofs are a traditional feature of Faroese houses, and help insulate them from the cold) I received my own knitting lesson in the restaurant, while downstairs a week-long painting workshop took inspiration from the implausibly dramatic weather and landscape: I’ve never been anywhere where the weather is so astonishingly fast – from sunshine to black thunderous gloom in seconds, and back again. Many artists, of course, use wool as part of their broader work. I also met Sissal Kristiansen, who has just quit her job to work full-time on her own brand Shisha. She designs bags, sweaters and more based around traditional Faroese patterns – patterns that aren’t simply decorative but, woven into the design, make the fabric itself stronger. While we chatted, she knitted. While I looked at her work, she knitted. I have the strong impression – as with many people in these stark but beautiful islands – that she may well knit in her sleep.